ER-model is used in a high-level (conceptual) design databases. 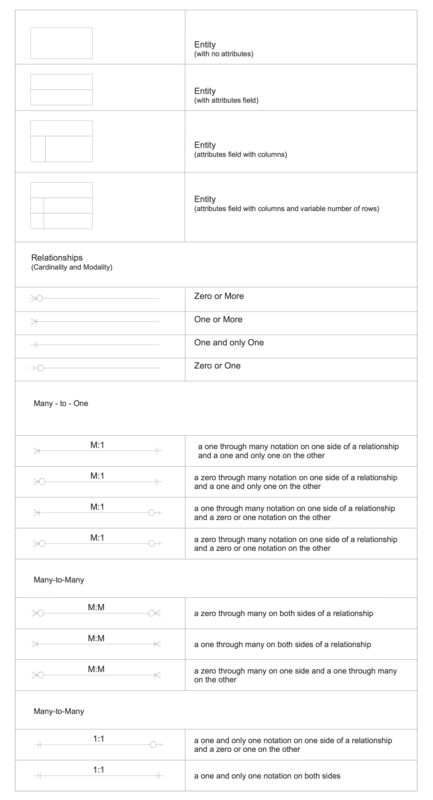 You can use it to identify key entities and designate connections that can be established between these entities. During database design the ER model is converted into specific database scheme based on the selected data model (relational, objective, networking, or any other). Crow's Foot notation was proposed by Gordon Everest, originally called Inverted Arrow. According to this notation, the entity is represented by rectangle containing its name. Name of the entity must be unique within this model. In this case, the name of the entity is a name of type, rather than a specific instance of this type. A concrete representative of the entity is called by the entity instance. The entity attributes are written inside the rectangle depicting entity. Among the attributes is also highlighted the entity key - the set of attributes the values ​​of which in aggregate are unique for each instance of the entity. Relation is depicted by line which ties two entities involved in a relationship. The plurality of the relationship is indicated graphically by a "plug" on the end of the link. Optionality of a link is marked by a circle at the end of the link. Entity-relationship diagrams based on both Chen's and Crow's Foot notations, can be easily drawn using the ConceptDraw DIAGRAM ERD diagrams software tools for design element Crow's Foot and Chen from Entity-Relationship Diagram (ERD) solution. ERD Crow's Foot library from Entity-Relationship Diagram (ERD) solution contains 17 Crow's Foot notation symbols. The shapes which include circles, bars, and symbols, indicate various possibilities. A single bar at Crows foot notation indicates one, a double bar indicates one and only one, a circle indicates zero, and a crow's foot indicates many. Entity Relationship Diagrams (ERD) illustrates the logical structure of databases. The vector graphic diagrams produced when using the ConceptDraw ERD solution can be successfully used in whitepapers, presentations, datasheets, posters, or any technical materials. Design Elements — Crow's Foot (Windows, Macintosh). The samples you see on this page were created in ConceptDraw DIAGRAM software in macOS and Windows using the Entity-Relationship Diagram (ERD) solution and show the ER Diagrams created with Crow's Foot notation. An experienced user spent 10 minutes creating each of these samples. Use the Entity-Relationship Diagram (ERD) Solution for ConceptDraw DIAGRAM to create quick and easy your own Entity-Relationship Diagrams using the Crow's Foot and Chen's notations. All source documents are vector graphic documents. They are available for reviewing, modifying, or converting to a variety of formats (PDF file, MS PowerPoint, MS Visio, and many other graphic formats) from the ConceptDraw STORE. 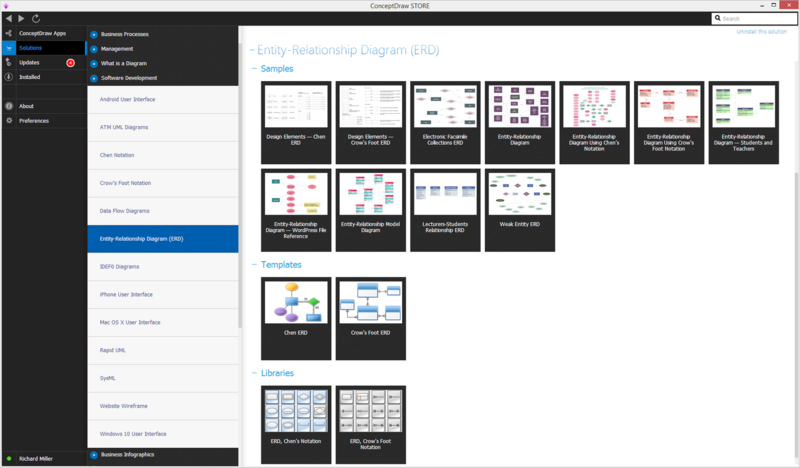 The Entity-Relationship Diagram (ERD) Solution is available for all ConceptDraw DIAGRAM users. An abstract representation is usually the first thing you will need while developing a database. To understand the ways that databases are structured, you should look through entity-relationship diagram examples and see the notations features and attributes. With an entity-relationship model you can describe a database of any complexity. This Entity-relationship diagram is a tool for software developers. It enables every element of database to be managed, communicated and tested before release. This ERD was created using symbols advocated by Chen's notation. Because of a linguistic origin of the Chen’s notation, the boxes representing entities could be interpreted as nouns, and the relationships between them are in verb form, shown on a diagram as a diamond. If we divide computer networks by scale, we get several main categories. The smallest network is PAN, as it connects personal devices themselves, and as the number of users grows, a local area network can be recognized, and campus area networks (CAN) connects several local networks located within some area like a university or a corporation. Computers connected to CAN share public educational materials and list of CAN network examples includes such prestigious universities like Stanford and Carnegie Mellon. This is an example of a computer network diagram created for a campus area network. It was created using using ConceptDraw solution for the Computer and Network diagramming. The specific of this sample campus network is its distribution. It is rather broad to embrace a big campus territory. This diagram can be applied as a template for designing custom area network topology diagram for a particular educational institution. 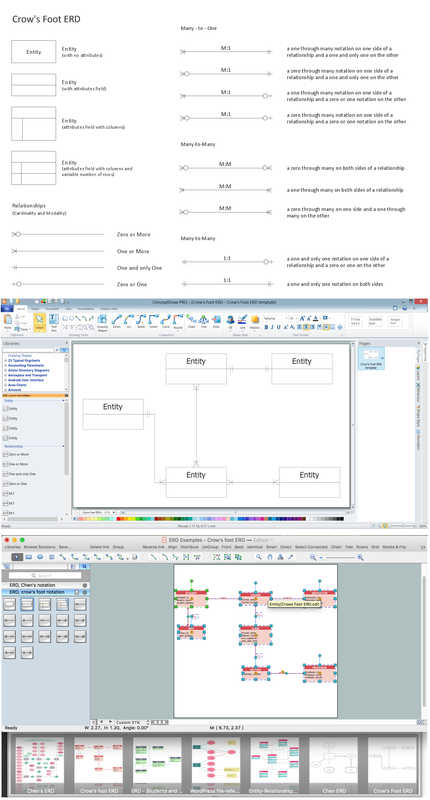 The Entity-Relationship Diagram (ERD) solution from ConceptDraw Solution Park extends ConceptDraw DIAGRAM v12 ector graphics and diagramming software with the ability to describe a database using the Entity-Relationship (Chen) model. Use it for design your ERDs and verify that ConceptDraw DIAGRAM v12 offers the best ERD diagrams software tools for design element Chen notation. Using diagrams, you can visualize the flow of the information or build a detailed data structure. There's no need to have a degree in software and database design with ConceptDraw DIAGRAM v12, because this software has all the tools needed in developing models and diagrams. Project planning, designing and prototyping was never so easy. This UML diagrams can be used to visualize a model of the data base development process. A UML diagram shows a graphical view of a structure of software system: components and relationships. Using Unified Modeling Language helps to depict logical and physical elements of a data base, visually represent requirements and sub-systems. UML diagrams allows developers to organize and predict critical issues, as well as collaborate data base information. In software engineering, it is important to understand how the system would cooperate with external sources, like data sources. To give this information a visual representation, data flow diagrams (DFD) were used for years. The entire system is usually divided into smaller ones, and all of them process data flows in appropriate ways. The visualizing business processes which engages the data transfer, is commonly preformed using DFDs (data flow diagrams). DFD is used to show the data flow processing and transformation. This DFD represents the electronic system of a customer purchase. It was created using Gane/Sarson notation. Data flow diagrams helps you to sort through and clarify transferring process making it available for analysis, and representation. ConceptDraw DFD solution introduces the vector library, containing the full set of icons from DFD notations. ConceptDraw DIAGRAM v12 diagramming and vector drawing software provides the Telecommunication Network Diagrams Solution from the Computer and Networks Area for quick and easy drawing the Telecommunications Networks.